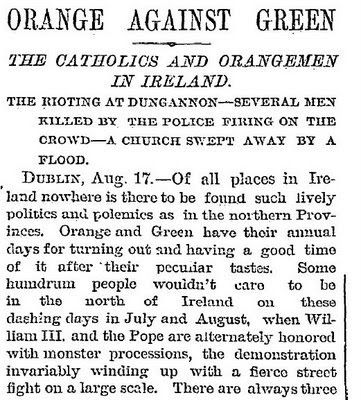 Welcome to the 31st edition of the Carnival of Divided Government - The ûnus et trîcênsimus - Special St. Patrick's Day Edition. DWSUWF passionately supports all drinking holidays and in particular St. Patrick's Day. As motivation to get this Carnival completed ASAP, DWSUWF will forgo his first Guinness until such time that this Carnival is posted. Alright. Lets crank this baby out. I'm thirsty. Saint Patrick - The Patron Saint of Drunks. Those were the days when partisan polarization actually meant something. I don't know what my grandmother was thinking. I guess she expected me to take on the entire green-attired grade school and instigate a brawl on the playground during recess. Thanks Grandma. But here at DWSUWF we are more concerned with the implications of Red vs. Blue government than Orange vs. Green religious squabbles. As explained in earlier editions, we have adopted Latin ordinal numeration to impart a patina of gravitas reflecting the historical importance of the series. In this the Carnival of Divided Government ûnus et trîcênsimus (XXXI), as in all of the CODGOV series, we select volunteers and draftees from the blogosphere and main stream media writing on the single topic of government divided between the Red and Blue parties (leaving it to the reader to sort out volunteers from draftees). Consistent with this topic, the primary criteria for acceptance in the carnival is to explicitly use the words and/or concept of "divided government" in submitted posts. A criteria that, to our endless befuddlement, is ignored by many of the bloggers submitting posts, which sadly results in DWSUWF reluctantly ignoring their fine submissions. Today, two months into a great big blue legislative tsunami, we are beginning to see yet again the consequences of granting unfettered power to a single party. Awash in a sea of new spending programs, our children Grandchildren will soon be drowning in oceans of debt. DWSUWF can only offer a this selection of red, blue, and purple divided government posts as a life preserver to cling to during the spending flood. 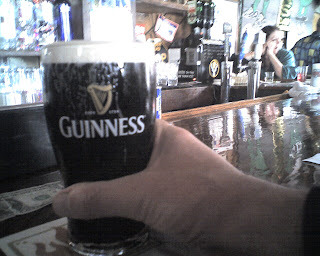 Just hold on and dream of that first Guinness of the night. "Divided government occurs when the executive fails to enjoy majority support in at least one working house of the legislature. To date, the study of divided government has focused almost exclusively on the United States. 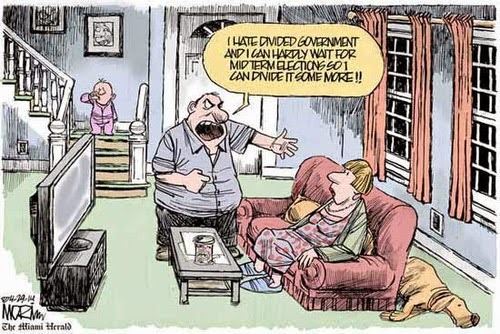 However, divided government occurs much more widely. It occurs in other presidential systems. Moreover, it is also the equivalent of minority government in parliamentary regimes and cohabitation in French-style semi-presidential systems. This book examines the frequency, causes and management of divided government in comparative context, identifying the similarities and differences between the various experiences of this increasingly frequent form of government. The countries studied include Denmark, Ecuador, Finland, France, Germany, Ireland, Italy, Mexico, Norway, Poland, and the US. " Sound interesting. I'll read it as soon as the price drops by about 90% or so. $160 for a 256 page book? Really Robert? Really? "The issue of separation of Powers does not seem to be confined to Perak these days. The following excerpt is from a transcript of a monologue from prominent American radio personality - Rush Limbaugh - who examines the concept of the Separation of Powers from a historical and current perspective for the United States (which could be also applicable for Malaysia..."
"The whole theory of the separation of powers, meaning legislative branch, judicial branch, executive branch, was ingeniously based on human nature. Our Founding Fathers had studied history, and they knew that absolute power corrupts absolutely. So we divide power. We divide power between the states and the federal government. We divide power within the federal government. And we further divide power among three separate branches of government. We give each branch a different set of powers and incentives to protect their own prerogatives so they can keep an eye on each other. These are called checks and balances. The underlying assumption of this whole system is that the country functions better if everyone is of a skeptical bent of mind. That’s what keeps the next guy honest. The whole reason that we have divided government instead of a king is that the issue is not about one government official succeeding. This country was not founded on the principle that the president is a king and above all the king must succeed. In fact, the system is designed to ensure that the president fails when he is wrong. That’s the whole purpose of checks and balances." "The media has put that notion out there, and they've done it for a number years. They tried it in 2002 and 2004 in the sense it would be good. "We have one-party rule. Why, that leads to corruption and leads to people becoming out of touch in Washington." They love one-party rule when it's them. The only reason they're against one-party rule is because they're not the party, and so they're trying to say it leads to all kinds of bad things. But that means they don't trust the democratic process. The democratic process delivers what it delivers, and if it delivers a Republican dominated House and Senate and a Republican president, then that's representative democracy at work. That is what you get in a representative republic, and to sit there and complain about it is to complain about the system itself." "Assholes must be made to counteract assholes." "I have written of the dangers of one party, regardless of which party, having total control, and expressed a preference that the Democrats remain shy of sixty Senate votes. Ideally I would prefer that we do not even have one party control both houses of Congress as well as the White House. There is a problem with a preference for divided government when one party has ceased to be able to respond meaningfully to current problems. There is a reason why independents have been moving towards the Democratic Party in recent years. Rush Limbaugh is a showman. He has no coherent political views beyond a set of simplistic talking points. People like Limbaugh, Coulter, and Hannity appeal to the worst parts of human nature and ignorance and do attract an audience. This does not mean that their views should become the guiding principles of a political party. Hoping to see the restoration of a viable two party system, I am interested when some conservatives support rejecting the anti-intellectual, authoritarian, no-nothing mindset which has taken control of the conservative movement." I am in general agreement with Ron's post and thesis, but ... methinks he doth protest too much about the insufficiently intellectual nature of GOP opposition. In our system of government, it is important that a minority opposition party actually oppose the party in power. It is less important whether the opposition comes up to snuff on Ron's criteria of being a sufficiently intellectual opponent. If the Democrats had done their job as a minority opposition party in 2002, perhaps we would not be saddled with the crushing human and financial burden of the Iraq war. If the Republicans do their job as a minority opposition party in 2009, perhaps future generations will be able to avoid being saddled with the crushing debt and government entitlements being promoted and expanded by Obama and the Democrats. "While I definitely agree that president Obama should not overstep his bounds as president, there is something to be said about a strongly democratic president and congress. Perhaps there will be less bickering, and more positive action (health care reform, ending of “torture”, etc…)! While no branch should be given the opportunity to rule completely without anyone to check them, the people did vote for a democratic congress majority and president. I don’t think it is fair to equate the idiocy of the bush administration to the progressive Obama administration. Let’s give the democrats a chance and perhaps we will have something to HOPE™ for!" Here is the problem Liz - This is not about whether Obama takes advantage of and abuses the near monarchical powers claimed by the Bush/Cheney administration. He said during the campaign he would move to help restore the balance with Congress and the Judiciary. He isn't. He is doing the exact opposite by actively defending, continuing, and extending the power of the Bush/Cheney definition of the unitary executive. Even if you believe that Obama is a kind and good benevolent king, he won't be king forever. I hope you are as sanguine about the expanded power of the presidency when a Romney, or Palin, or - God forbid - if circumstances dictate that Biden has to take the reigns. People were not voting for Single Party Progressive Democratic Ruleso much as they were voting against what Liz calls the "idiocy of the Bush administration". Unfortunately, but predictably - Obama and Progressives now operate as if they have a mandate for radical progressive change, while the Independents and Centrists that voted for Obama are getting buyer's remorse. Too late. The left has the votes, the right is emasculated, and there is no telling how much damage will be done over the next four years to the budget, our economic liberties and our already broken economy. The least Obama could do is use his extraordinary executive power to restore the civil liberties lost under the Bush administration, but even that is not happening. The way to achieve centrist government is not by electing politicians who will whisper sweet centrist nothings in your ear. The way to achieve centrist government is to never ever ever give either party all the power. "What are we to do? We can do nothing except remember, at the next election, just who voted to put us and our heredity into hock and who voted against it. " In other words, some of us will be voting for those who just said "No". Contrary to what President Obama asserted in his speech defending the budget today, "Just say no" is the exact right thing to say to this insane spending. I can't wait. I'm going out for that Guinness right now. Now I've done it. I am not sure that I will get this special St. Patrick's Day post actually posted on St. Patrick's Day. Let's just soldier on and see what happens. "The day after the 2008 election, on November 5, when it was disclosed that Rahm Emmanuel would be the top pick for President Obama's Chief of Staff, Levin lambasted his choice as someone who was "a vicious graceless partisan: narrow, hectic, unremittingly aggressive, vulgar, and impatient." This, for Levin, was a bad sign and he criticized the new President because it "suggests both that he wants to be ruthless and partisan and that he does not have a clear sense of how the White House works." Perhaps his essay should have been titled "Partisanship is Good (But Only If My Side Wins)". With such a statement it would seem that Levin’s view of human nature has no concept of hypocrisy. Such outright duplicity not only illuminates his approach as an advocate of Ethics and Public Policy, it is the very nature of partisan politics that we should all seek to avoid." I would encourage you to read both of Eric's posts in totality, but I would distill his argument to this - "Conservatives are bad and wrong. Liberals are good and right. Therefore Conservative partisan opposition to Liberal proposals are bad and wrong. QED. " Perhaps Eric Johnson's essay should have been titled "Partisanship is Bad (But Only If My Side Loses)." DWSUWF has opined before on this topic, most notably in this historical meditation and the post Polarized Partisan Politics Promotes Popular Participation. 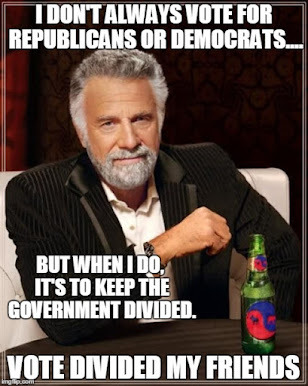 "Americans do not prefer divided government. They are not Broderists. Americans who are Democrats prefer Democratic rule; Americans who are Republicans prefer Republican rule." Problem being, there is a glaring logical flaw in this statement. In order to conclude that Americans do not prefer divided government as Hendrik does here, one must conclude that all Americans are either partisan Democrats or partisan Republicans. Actual poll data does not support this premise. Depending on how you want to slice and dice the data, the general conclusion is that about 1/3 of the electorate identify Democrat, 1/3 identify Republican, and 1/3 identify as some version of Independent, Non-Affiliated, Libertarianish (Fiscal Conservative / Social Liberal), or Centrist. This center may register Democrat or Republican but will shift their vote from election to election, which means you cannot identify the electoral preference by looking at one election tally as Hendrik does here. The simple fact is that voters who are philosophically aligned with fiscal conservatism, liberal social tolerance, live and let live diversity and limited government do not have much of a choice between big spending, big deficit, big government Republicans and bigger spending, bigger deficit, bigger government Democrats. They very well may decide that the real choice is between the unrestrained growth of government size and power under single party rule, or the relatively constrained growth that is only found under divided government. I can't take this anymore. It is almost midnight. I am going to post this thing now, warts and all, just so I can say I got it posted on St. Patrick's Day, even if it is only St Patrick's Day somewhere the Hawaiian time zone. I'll clean up the typos and graphics tomorrow, and there are a few more posts I'd like to add. Why don't we just call this the St. Patty's Season, and I'll just keep drinking Guinness and polishing this turd until I feel like moving on to another post. Traditionally, we conclude this Carnival by including one "off-topic" submission, as a grudging acknowledgment and proxy for the many off-topic submissions received. Off-topic in this context meaning - no mentions of "divided government" or gridlock. For this issue we offer Angry Max presenting The Quests for Truth and Blood posted at Pterodactyl Puke, saying, "Concerning who, in both parties, is responsible for the economic meltdown, and what to do with them." The post could be considered thematically on topic, but that is not why I am including it. I am including it because it is funny, informative, deadly accurate, and borderline genius. Read it and enjoy it. And on that happy note we conclude this edition. Thanks for stopping by, and thanks for all of the submissions (on-topic or not). As previously announced - Since this carnival is focused on the topic of Divided Government, and seeing how voters spectacularly rejected the idea in the last election, and with no real prospect of restoring divided government before 2012, we have put this carnival on a reduced publication schedule over the next year. Instead of monthly, we'll go quarterly or - you know - whenever I feel like it. Look for the next edition of The Carnival of Divided GovernmentXXXII - Special Memorial Day Edition sometime around - oh.. lets say May 25. Submit your blog article at carnival of divided government using our carnival submission form. Bobo presents "The Bobo Carnival of Politics" at The Bobo Files. Quisani presents the "Carnival of Conservatism" at The Quisani League. Stefanie presents "All Things Eco" at Focus Organic. U.S Common Sense presents Political Blog Weekly. Jonathon present the "Seventh Carnival of Modern Liberty" at Liberal England. Mark Raynar presents the "Carnival of Satire" at The Skwib. Added unacceptably delayed and unfairly overlooked carnivals and links. "big blue legislative tsunami" I love that line! Perhaps because my favorite color is blue. Thanks for putting me in your post! Thanks for the comment. I'll ramp up the divided government carnival again in 2010. Maybe earlier. There just has not been that much interest in the subject since the election. Although, as we spend ourselves into ruin, I am beginning to get the sense that there is a lot of buyer remorse out there - not specifically about Obama, but about giving the Democrats all of the keys to the treasury. BTW - You've got a great blog, one of my favorites.